Pompey Supporters' Trust chairman Ashley Brown says he is proud of its achievements running Portsmouth. It is 12 months since the PST reached a settlement with former owner Balram Chainrai to take control of the club. Despite their off-field success, Pompey are currently 19th in League Two, just five points above the relegation zone. "Even during this time of poor form we are still getting incredible gates and support and that makes me very proud to be a Pompey fan," Brown told BBC Sport. A year on from that dramatic day at the High Court in London where the PST and Chainrai's Portpin struck a deal, Portsmouth, under the guidance of the PST, are in good shape financially. It is in stark contrast to years of mismanagement under previous owners which resulted in the club entering administration twice in three years. Brown says Pompey are still feeling the legacy of previous owners but the club are ahead of schedule in their payments to former creditors and players. As things stand the Trust has 2,300 shareholders who between them have raised around £2.5m through individual pledges of £1,000. The PST currently owns just under 51% of the club with a group of 11 presidents making up the remaining share. Those presidents include Portsmouth chairman Iain McInness and property developer Stuart Robinson, and bankrolled the club during the last administration. Robinson himself owns lands surrounding Fratton Park and plans have been submitted for a Tesco store behind the ground - something that will finally see the site redeveloped and transformed. Portsmouth's presidents have also injected £500,000 to help with ground improvements which will take potential attendance to around 20,000 next season. That capacity may seem unnecessary in League Two but the club's current healthy financial state is thanks largely to the 15,000 fans who have turned out regularly to support their side. 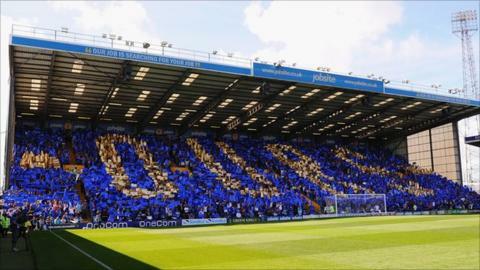 One supporter, Bob Beech, refused to go to Fratton Park last season under Chainrai's ownership but says the atmosphere at the club could now not be different. "Everyone walks around Fratton Park with a smile on their face," Beech told BBC Sport. "I look around Fratton Park now and there is a real feel of being part of something special." Beech campaigned tirelessly with protest group 'SOS Pompey' to rid the club of Chainrai and 12 months on from the PST taking control believes their fight has been justified. "Portsmouth has to be a beacon of light for every football club in the country that fan ownership is workable and sustainable," he said. "The biggest difference is people are putting their hands in their pockets now and buying a programme, pie, match ticket or a shirt and that money is going into the club. It is not disappearing into an offshore account." The PST continues to grow, with new pledges now accepted up until July having been extended from their original 19 April deadline - the official date for their completed takeover last year. Strong season tickets sales and the continuation of healthy crowds will further strengthen the club's financial position. But Brown says that while huge strides have been made off the pitch, success on the field has to be their priority next season. "Over the next 12 months it is the stuff on the pitch that we must get right," he said. "We do want to be pushing for promotion next year. We have achieved so much operationally off the pitch so we have to do that on the pitch." Brown admitted he had struggled to enjoy the past year due to the stress of poor form on the pitch and tough decisions such as parting company with two managers in the space of four months. Who are the Pompey Supporters' Trust? Guy Whittingham was sacked in November while the club parted company with Richie Barker in March. Brown says he does not want the PST to be "judged" for those decisions but added it was "the right one for the football club". "All that has meant it has been less enjoyable than I first thought but then we didn't do this for fun, we did it for the love of the football club and we always knew it would be tough." Brown says the club will continue to operate at a loss over the next 12 months but hope to move out of debt in years three and four of their business model as per plan. He adds though that their vision was always for "long-term financial stability" but believes they are on their way to proving that supporters can run football clubs. "We are trying to bring our own influence to the way football is run," he said, "I don't think it is any great secret that there are a number of clubs around the country who are not particularly receptive to input from their supporters. "If you take most businesses around the world and they are very keen to gain input from their customers and football does not necessarily do that. There are some clubs who are forward thinking in that aspect and we tend to be at the forefront of that." The Trust will meet with members and fans at Fratton Park on Wednesday, 16 April and when asked what their message will be, Brown's reply sums up what the PST is all about. "Stick with us will be the message, but most importantly we will be listening to the fans."